Kick summer frizzy hair and sweaty makeup to the curb with beauty services from Lavender Salon & Boutique in Newport Beach, CA. Aside from looking your best in this insane summer heat, Lavender's wide but straight forward range of hair, skincare and makeup services are great for beauty maintenance as well as for special events. I came in last week for a a blowout and full makeup application, which I would be rocking later in the evening for a wedding ceremony and reception. Currently there's a summer special for $35 blowouts booked for Sundays-Tuesdays! YES, $35! Upon checking in with the front receptionist, I was seated in Lavender's very luxe and chic inside lounge area (there's also a great outside patio lounge area reserved for Lavender's guests) and offered a beverage so I gladly accepted a water. I was immediately drawn in by the opulence of the salon furnishings mixed with elements of modern design. I waited approximately 10-15 minutes past my appointment time, but when my hairstylist was ready (as she had been finishing up another client) she led me to the shampoo room to wash my hair. I received a Madame Chic - Lavender Signature Blowout which included a wash, blow dry and style (I asked for loose waves) by stylist Danielle (@daisydanielle). The hair washing experience was enjoyable as Danielle made sure the water was a good temperature for me and while laying back, there are large screen tv's on the ceiling displaying beautiful landscapes which create a relaxing environment. Afterwards she led me to her station and confirmed what type of curl I wanted and inquired if my hair held a curl well so she could asses how to better style my hair. During the service she made sure to follow up with me as to if I was liking the outcome of the blowout so she could make adjustments as needed; as I was a bit self conscious with some hair breakage at the top of my head and she keenly parted and styled my hair to hide the shorter hair pieces. I really liked how my hair turned out, she did a slightly tighter curl so that during the day the curls would loosen into a waves. During my blowout service, makeup artist Laurel (@beautybylaurel28) got started on my makeup service by introducing herself and then also matching foundation color to my skin. I like that she went ahead and got her station ready while I was still having my hair worked on so that we could get started on my makeup straight away. I had actually seen Laurel's work on a friend and was blown away by how bright the eye area looked and just the overall flawlessness of the makeup application so I personally requested Laurel to do my makeup. She did a Signature Makeup Application which is a full faced makeup look; she described each step of the makeup process to me and pointed out each product that she was using and the benefits of using it. Lavender has an amazing repertoire of cosmetics and skincare used for makeup application and it's available to purchase so I made sure to pick up a lip gloss to touch up during the wedding. I felt great when leaving the salon, and my hair and makeup lasted from 1:30pm-10pm with minimal touch ups (I used my own transluscent oil blotting pressed powder for shine control). Blowouts start at $45 which is comparable to other salons and dry bars, but with their current promotion of a $35 blowout booked on a Sunday-Thursday, you just can't beat that price (be sure to inquire on their current promotions and if there are restrictions by calling ahead). As well, the makeup service I received is typically $100, but when added to a hair or blowout service is only $80. I definitely reccomend Lavender Salon & Boutique for blowout services or hair and makeup services for a casual or special event. They even offer makeup lessons and house calls, as well as waxing services - Lavender is pretty much your one stop shop, then grab lunch at Cafe Gratitude next door afterwards! To Book An Appointment Call (949) 515-2900 or book online here. Check out all SERVICES Here! 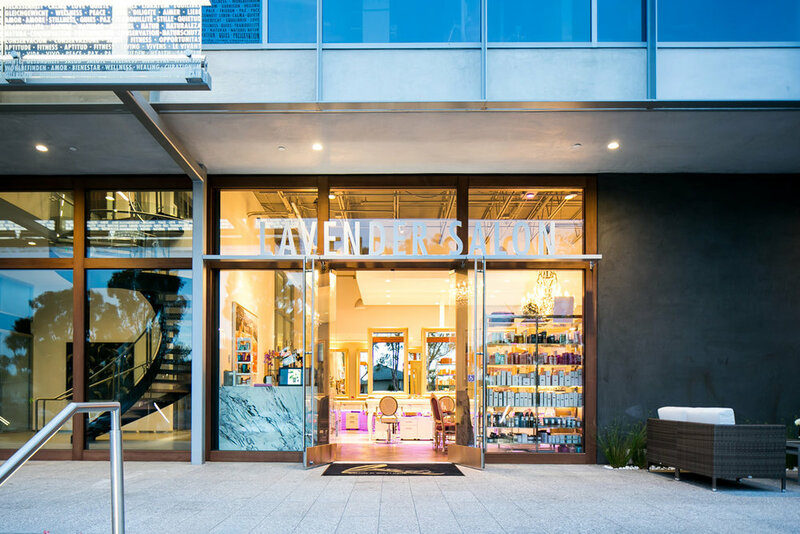 Opened in April 2016, Lavender Salon and Boutique in Newport Beach brings Left Bank Parisian style and beauty to the Left Coast…no international airfare required! Created by owner Heather Hart (pictured), Lavender Salon & Boutique treats clients to a luxurious and indulgent Parisian hair and beauty experience, encompassing all five senses: from the stunning visual ambiance created by Parisian decor, to the aroma of lavender, the taste of French champagne, and the curated touch of exclusive gift items hand-selected by the owner during her travels. Lavender Salon’s award-winning stylists, state-of-the-art equipment, advanced techniques and industry-best hair care, color and styling products – combined with five-star service – elevate the salon experience beyond any other found in Southern California. Salon Exterior and Wide Interior Images c/o Lavender Salon & Boutique website. Amanda of Feast.Fashion.Faves was not given monetary compensation but was provided the described beauty services gratis by Lavender Salon & Boutique, and organized by Kitchen Table PR. All opinions expressed are of her own.